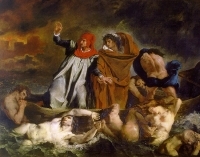 Eugène Delacroix’s 1822 painting of Virgil and Dante in Hell. In the midst of nowhere, neither here nor there Inevitable, yet not forthcoming Uncontrollable, letting go Distant, yet close Unforgettable Close to something, Helpless Yelling, turbulent, Intimate, not yet peaceful The Hastening of Death Life is short, make the most of lifelong dreams Guilt resists dying. Pain is our shadow! Ever closer through evasion. will we feel pain without suffering. He brought the poem back to me in supervision the next week and told me that he shared it with the client. How did you think the client reacted? The client cried a few silent tears and thanked my student. It was a poignant moment. The client survived her period of despair. She went on to live a few more weeks. What difference did my student make? It is hard to tell. Was there any measurable change in the client? Also difficult to tell, difficult to measure. What empirical evidence can we give to our therapeutic effectiveness? Who knows? It is difficult to say for the client, but I can share with you with a degree of certitude that both my student and I were profoundly changed—the evidence being what I remembered and shared with you here in this blog. For at least one evening, my student returned to poetry. We learned more about courage and bearing witness.